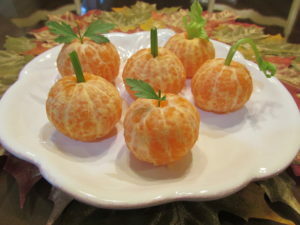 This festive healthy fall snack will sure to be a favorite! Have you noticed when searching for festive fall treats and snacks, almost everything that pops up is full of sugar. Halloween is especially difficult for parents to find nutritious foods for the kids to compete with all the sugary and chocolate treats that seem to be synonymous with trick or treating. If you are like me, you are always on the hunt for a fun healthy fall snack that delights the kids in place of all the processed sugary snacks. Since there is no getting away from all the junk that kids get while out trick-or-treating, I like to kick the night off with a dinner table full of fun festive foods, such as Mummy Dogs, Witches Hats, Creepy Crawly Worms and much more. A couple years back I decided to add some fruit to the mix with some festive pumpkin oranges and banana ghosts. 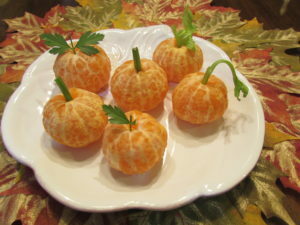 These quickly became one of the favorites for Halloween dinner! One time I even used some black food gel to great some creepy pumpkin faces – the kids loved it! The original recipe I found a few years back, called for using rhubarb for the pumpkin stem. Since rhubarb can be hard to find, and has a bitter taste that can turn kids off, I’ve used both celery and parsley. Since I always have fresh parsley on hand, I like to use it for some of the pumpkins to mimic the leaves of of pumpkin vines. The plus with celery, is now you’ve doubled up on both fruit and veggies for a double dose of healthy! Now that is a healthy fall snack. These are so easy and adorable, that they also make a great addition to the kiddo’s lunch to celebrate all the autumn festivities. They love them because they are festive, and I love them because they are actually healthy – crazy, healthy and Halloween in the same sentence. Peel the tangerines or oranges.